Tomoko Nagashima and Kazuma Fujimoto, both hailing from the Hyogo prefecture, met in the music club at Kansei Gakuin University in Osaka. 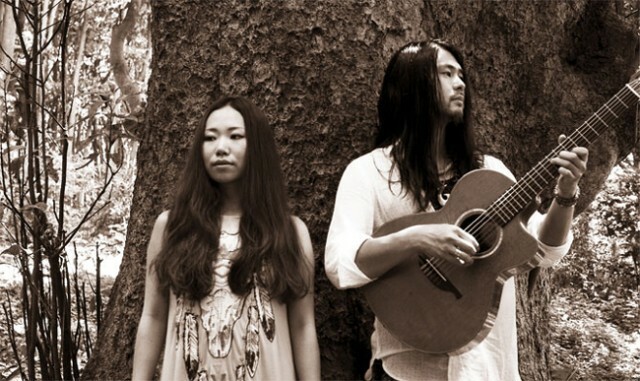 orange pekoe was formed in 1998 with Tomoko as vocalist and lyricist, and Kazuma in charge of guitar, composing and programming. They began writing their jazz-style music with influences from their favourite artists, such as Stevie Wonder, The Beatles and Brazilian artist Milton Nascimento. Their career kicked off with performances in various clubs and cafes in the Kansai area and they released their debut, a self-titled indie mini-album consisting of four tracks, in 2001. Their popularity grew after their work was given airtime on the Osakan radio station funky802, and shortly after the pair were signed to BMG Japan where they remain till today. The year 2002 saw the release of their first single under the major label Happy Valley. This was heard on all major FM stations across the nation and led to the success of their first album, Organic Plastic Music, which sold over 300,000 copies and reached #5 on the Oricon album charts. After the positive response to their major label debut, the band released their second album, Modern Lights, in 2003, which was another hit, reaching #6 on the Oricon charts. More singles, albums and another mini-album were released in the following years with mixed success in the chart rankings—their third album, POETIC ORE; Invisible Beautiful Realism, reached #10 but the fourth, Grace, only #29. Their fans’ enthusiasm for their music continued, however, as can be seen by their turnout at the duo’s successful Poetic Ore national tour in 2004 and the many others that they embark on annually, be they large or small. Since 2007, the band have adopted a 70’s style, which is reflected in their cover art, music videos and fashion sense up to the present. A distinct disco sound can be heard in their 2007 single, KIRA KIRA, from fifth full-length album Wild Flowers. Many of their single and album covers, especially those released earlier, have distinctive hand-drawn artwork by Kunie Kanbara. These feature slightly surreal, decorated female profiles and suit the band’s carefree and positive musical style. The last release to feature her illustrations was their 2008 10th anniversary album Sun & Moon, a compilation of their singles and the best of their work over the previous decade. Their 12th single, Marigold, featured as the opening theme for the anime “Ristorante Paradiso,” was also chosen as the theme song for Japan Day 2009 in May in Central Park, New York. The band was also invited to play at the festival, which was their first US performance and they were very well received by locals. Currently the band is still promoting their latest album Crystalismo which features the singles Marigold and CRYSTARHYTHM, and have announced an acoustic tour for Summer 2010, playing at Nagoya, Osaka and Tokyo.